214 PTOLEMY, C. / SWEYNHEYM, C. Prima Asiae Tabula. Rome, 1478 or 1490. Uncoloured. Paper very slightly age toned but in general in very good condition. Printed on two joined sheets. With a repair net to center fold, hardly notable. 370 x 535 mm. Je voudrais de plus amples renseignements sur le Lot N°34767 . Includes excellent detail, based upon Ptolemy, including the marginal notes. 215 ORTELIUS, A. 1) Natoliae,.. 2) Aegypti recentior.. 3) Carthaginis.. Anvers, ca. 1598. Beau col. Texte français. 320 x 490 mm. Je voudrais de plus amples renseignements sur le Lot N°60037 . ¤ Map to the left east to the top. Detailed map Turkey, including Cyprus and Crete. Also map of the Nile delta and another map of Tunis. 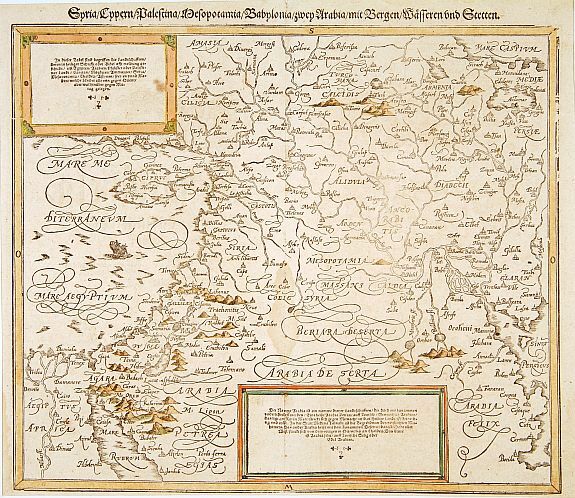 From 'Theatrum Orbis Terrarum. - Koeman, Altantes Neerlandici, vol. III, Ort 29b; Philips, Atlases, 396..
216 MERIAN, M. Constantinopolitanae urbis effigies ad vivum expressa, quam Turcae Stampoldam vocant. A° MDCXXXV. Frankfurt, 1635. Uncoloured. Some age-toning of the paper. One fold separated and underlaid. Dark and good impression. 228 x 695 mm. Je voudrais de plus amples renseignements sur le Lot N°32230 . 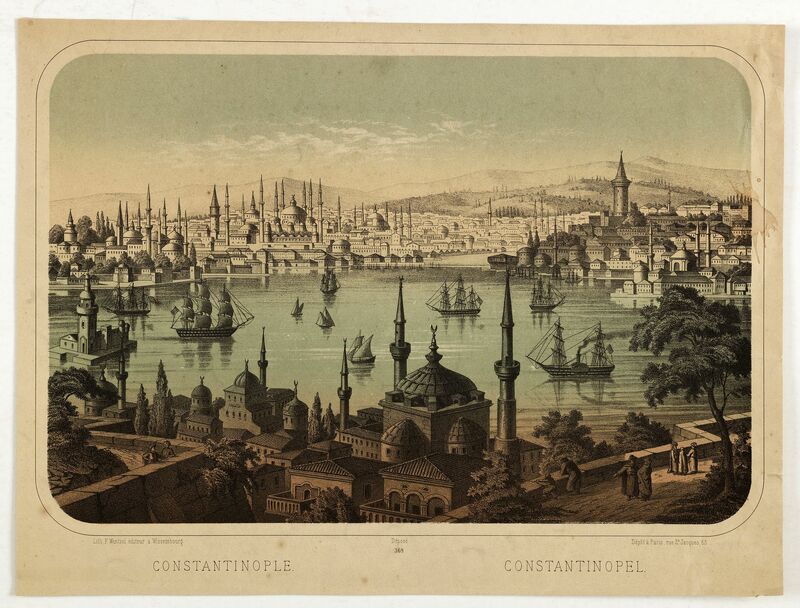 ¤ Large, decorative view of the city of Constantinople, with legend across the bottom. It is beautifully engraved with quaint scenes of everyday life, including hunters with their dogs in the near foreground. Across the Golden Horn the various palaces, mosques and principal buildings. Copper engraving, printed from 2 plates and originally mounted, by Matthäus Merian. 217 SANSON, N./ MARIETTE, P. Les Estats de l'Empire des Turqs en Asie. Paris, 1650. In original o/l colours. Paper contemporarily cut till plate mark and laid down on a larger sheet of paper. Good and dark impression. 398 x 515 mm. Je voudrais de plus amples renseignements sur le Lot N°13047 . 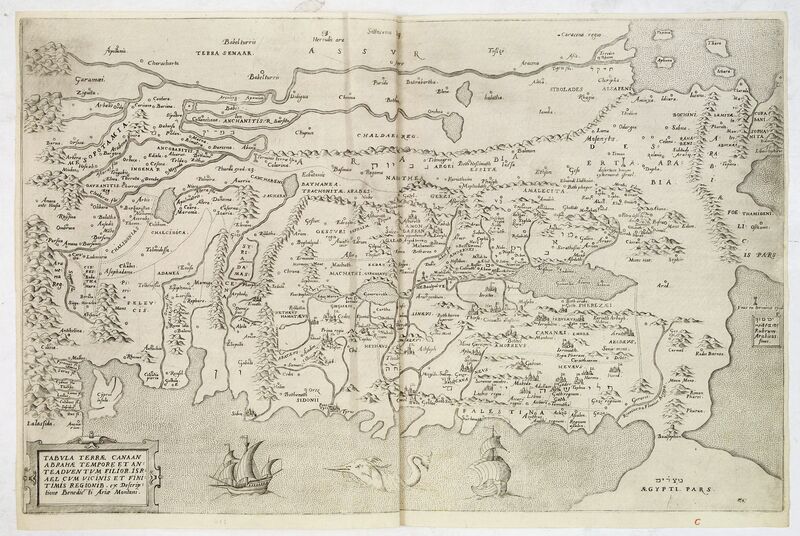 ¤ Fine map of the Near East with Turkey, Palestine and the Crim area. 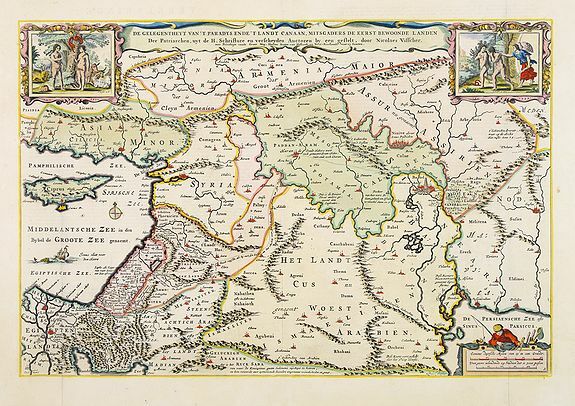 Nicolas Sanson was to bring about the rise of French cartography, although the fierce competition of the Dutch would last until the end of the century. His success was partly owing to the partnership with the publisher Pierre Mariette. In 1644 the latter had purchased the business of Melchior Tavernier, and helped Sanson with financial support in producing the maps. In 1657 Pierre Marriette died, however his son, also named Pierre, co-published the following years. 218 HONDIUS, H. Natolia, quae olim Asia Minor. Amsterdam, 1655. Original colours. Paper slightly browned and age-toned as usual. Paper creased along centerfold. 385 x 500 mm. Je voudrais de plus amples renseignements sur le Lot N°6750 . 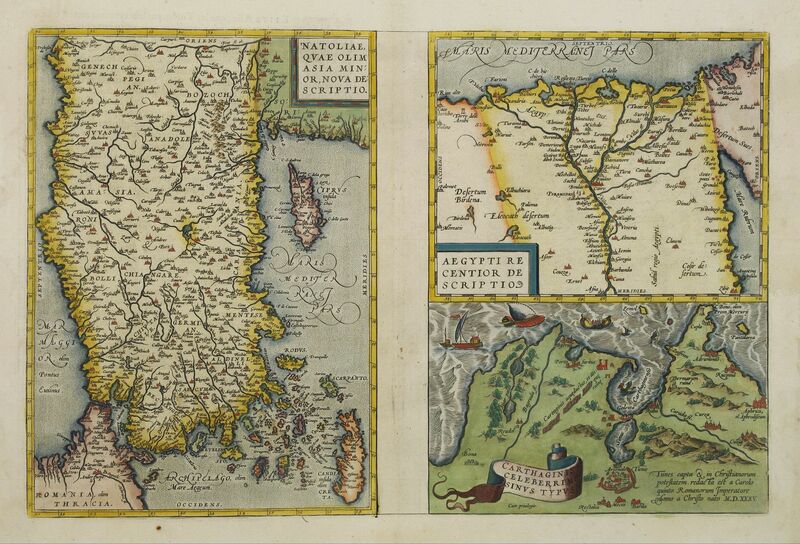 ¤ A finely designed map of Turkey and Cyprus from the great Hondius family of Amsterdam. 219 VISSCHER,N. Tabula nova geographica Natoliae et Asiae minoris.. Amsterdam, 1660. In original colours. Upper part some minor staining. Good condition. 440 x 533 mm. Je voudrais de plus amples renseignements sur le Lot N°12281 . 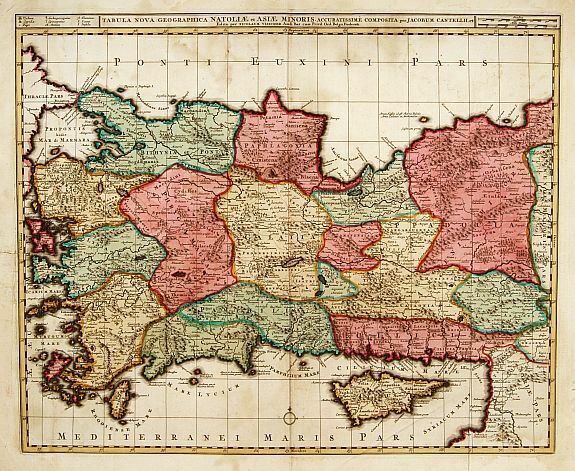 ¤ Uncommon map of Turkey, also depicting Cyprus. 220 DU VAL, P. La Mer Mediterrannée vers l'Orient . . . Paris, 1666. In original o/l colours. Very light water stain in upper part of the map with very light foxing of paper. 506 x 395 mm. Je voudrais de plus amples renseignements sur le Lot N°31686 . 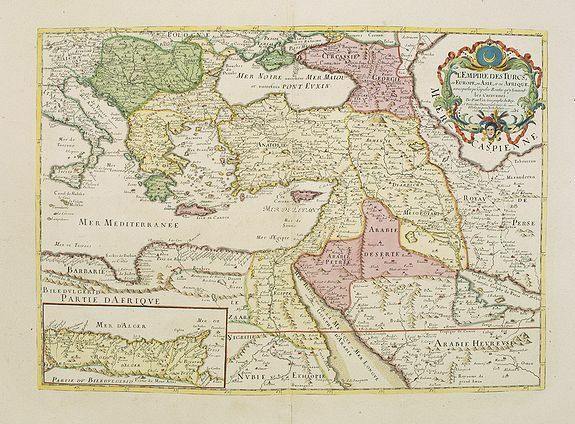 ¤ Scarce map of the eastern part of the Mediterranean sea and coasts, including Cyprus, Greece, Turkey, Holy Land, Georgia, the Black Sea and part of the Caspian Sea. 221 DU VAL, P. L'Empire des Turcs en Europe, en Asie et en Afrique. Paris, 1686. Uncoloured. Map cut on neat line and contemporarily pasted on a larger sheet of paper. Slight marginal browning. Very good and dark impression. 100 x 123 mm. Je voudrais de plus amples renseignements sur le Lot N°28635 . 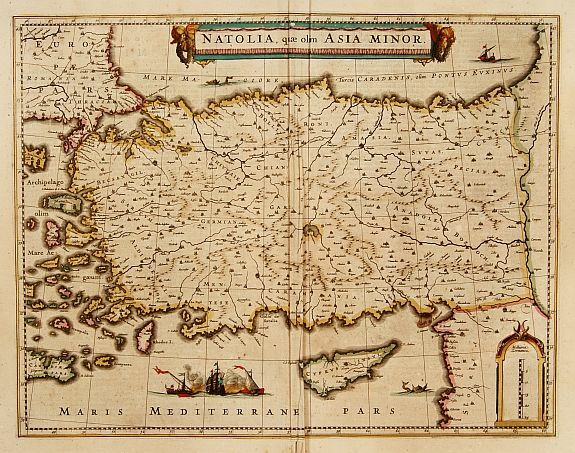 ¤ A nice map showing the Turkish Empire, including an inset map of kingdom of Alger. Extending from Italy and the Eastern Mediterranean in the west to the Caspian Sea and Persia in the East and from the Ukraine and Hungary in the north to the Gulf of Arabia in the south. Title cartouche in the upper right-hand corner. With the address : A Paris chez l'auteur sur le quay de l'Orloge proche le Palais, with un updated date "1686". 222 DU VAL, P. L'Empire des Turcs en Europe, en Asie et en Afrique. Paris, 1686. Beau col. Coupé au cuivre et collé anciennement sur papier fort. - Cut till the neat line and contemporarily pasted on a larger sheet . Fine colour. 385 x 530 mm. Je voudrais de plus amples renseignements sur le Lot N°14223 . ¤ With the date change to1686, probably published in the last and posthume edition of 1688. Prepared by N.Sanson. Depicting the route from "Caire" to "La Mecque". A uncommon map showing the Turkish Empire, including an inset map of kingdom of Alger. Title cartouche in the upper right-hand corner. 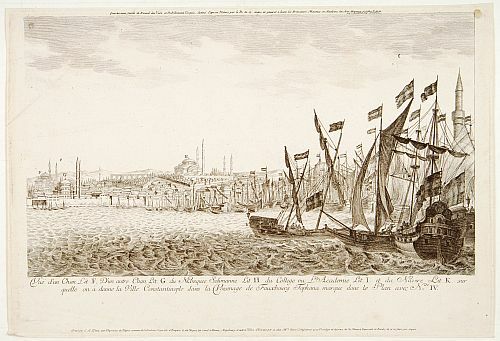 With the address : "A Paris chez l'auteur sur le quay de l'Orloge, proche le Palais". - Pastoureau, Duval II D, ; Tibbetts, Arabia in early maps, (131). 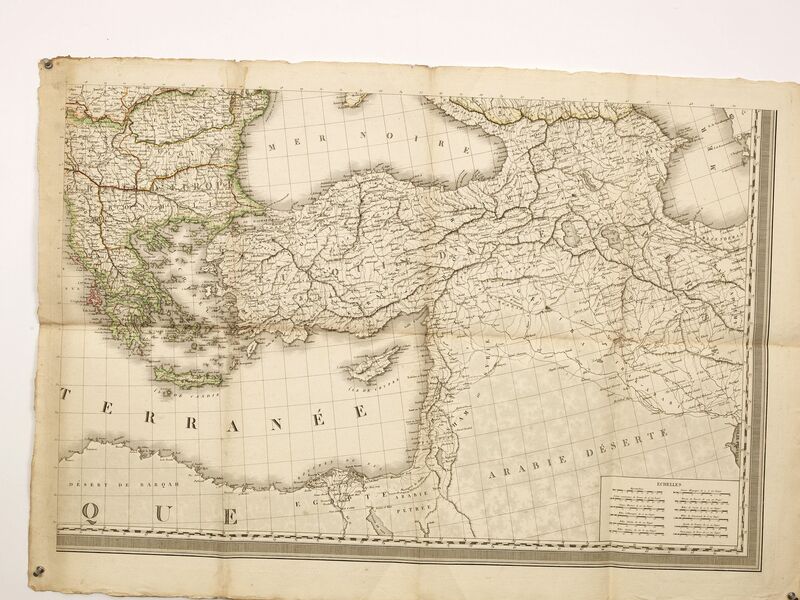 223 LAPIE, P. (Untitled map of Turkey, Greece and the Near East. Paris, 1812. Uncoloured. Dark impression, printed on heavy paper. 589 x 890 mm. Je voudrais de plus amples renseignements sur le Lot N°34487 . ¤ The lower right sheet of a 4 sheet map of Europe, including Turkey, Greece, Black Sea, Holy Land, Georgie, Iran, Iraq, Armenia. In lower right corner inset with 12 different scales. 224 FERRARIO, G. [No title]. [Shamanes - Téleuths]. Milan, 1827. In attractive strong original colours. Very good condition. 210 x 262 mm. Je voudrais de plus amples renseignements sur le Lot N°25819 . 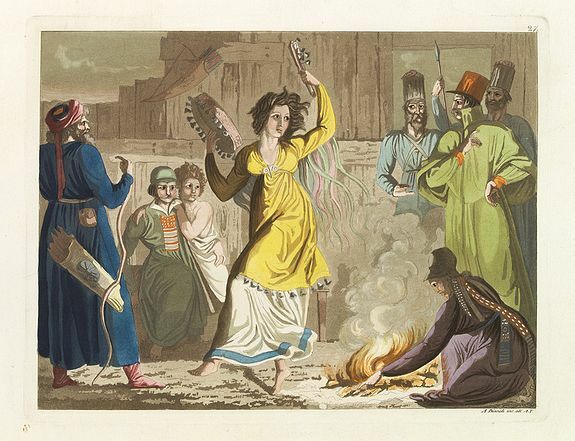 ¤ Aquatint depicting a woman dancing around a camp fire engraved by D.K. Bonatti, after drawings by C. Bottigella of a family of Turkestan. Plate N° 27. From Giulio Ferrario's work Le Costume Ancien et Moderne ou Histoire du gouvernement, de la milice, de la religion, des arts, sciences et usages de tous les peuples anciens et modernes d'après les monumens de l'antiquité et accompagné de dessins analogues au au sujet par le Docteur Jules Ferrario. Asie IV.me Vol". 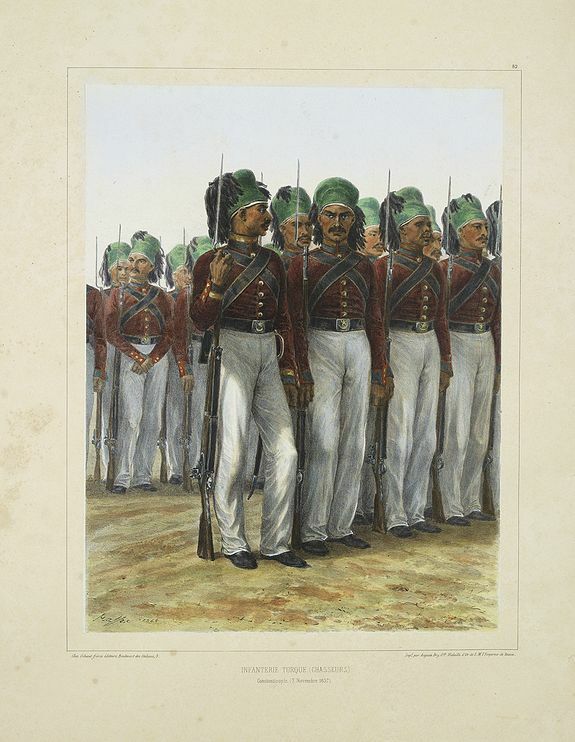 225 RAFFET, A. Infanterie Turque (chasseurs). 7 novembre 1837. Paris, Gihaut frères, 1848. In original colours. Lithography on heavy paper, finished by hand and gum Arabic. Wide margin, spotting in the margin. 330 x 252 mm. Je voudrais de plus amples renseignements sur le Lot N°29064 . ¤ Beautiful lithography by Auguste Raffet (1804 -1860 ) and printed by Auguste Bry. 226 JACOMME et CIE. (Untitled view from Scutari with a view of Constantinople) Paris, 1860. Lithography on tinted ground. Lithography on tinted grounds. Mint condition. 410 x 570 mm. Je voudrais de plus amples renseignements sur le Lot N°34062 . ¤ Panoramic view from Scutari with a view of Constantinople in the distance, after a design by Johann Schranz. Published by J. Missiriè. 227 LEBRETON, L. ANGLAIS 1833 Entrée des Dardanelles, L'avant-Garde de l'escadre Anglaise franchit le détroit, Novembre 1853. Paris, Lemercier, c.1860. In original colours. Lithography on tinted grounds finished by hand. Some light marginal discolouration. Good condition. 195 x 276 mm. Je voudrais de plus amples renseignements sur le Lot N°31039 . 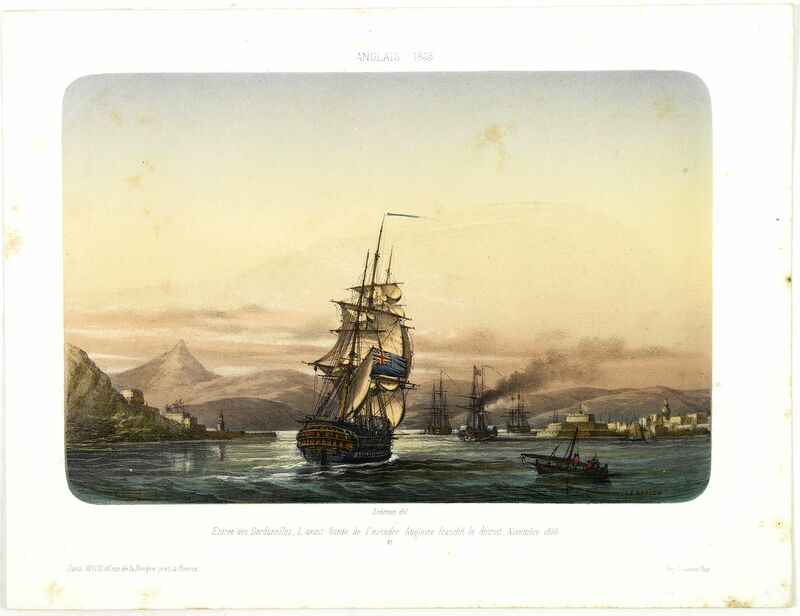 ¤ Beautiful lithography of a English ship entering the Dardanelles, or formerly known as the Hellespont in Turkey on November 1853. After a design Louis by Le Breton. Louis LeBreton was a surgeon in the French Navy from 1836-1848. During that period he made several very long expeditions including Dumont d'Urville's second circumnavigation (1837-1840) aboard the Astrolabe. 228 WENTZEL, F. Ch. Constantinople. 369 Wissembourg, after 1869. In original colours. Colour lithography. Brown spot in left hand part. Paper age-toned. Fine condition. 260 x 380 mm. Je voudrais de plus amples renseignements sur le Lot N°34585 . ¤ Lithography on tined grounds with a fine view of Constantinople. John Frederick Wentzel (1807-1869), was a native of Wentzel, a small town in Alsace and was trained as a bookbinder and started selling books before he became a lithographer in 1835. He started printing and selling popular imagery and than moved into his town of birth: Wissembourg, Bas-Rhin, France. His company quickly became a success, producing significant quantities of images distributed throughout Europe, from Warsaw to Dublin. In 1855 Wentzel opens a sales depot in Paris at the printer Nicolas Humbert (65, rue Saint-Jacques in the 5th arrondissement), before buying it in 1865. John Frederick Wentzel dies on July 27, 1869 and his son, Frederick Charles (at Wissembourg) and Charles Frederick (at the Parisian deposit) succeeded him. 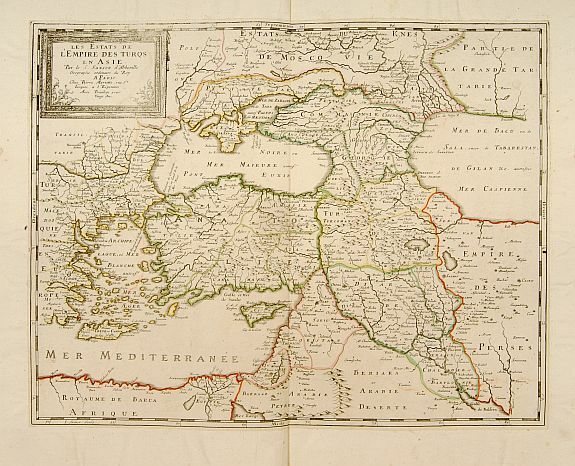 229 L'ACADEMIE Quartozieme feuille .. Constantinople.. Augsbourg, 1740. Uncoloured. A good and dark impression. 254 x 400 mm. Je voudrais de plus amples renseignements sur le Lot N°3873 . 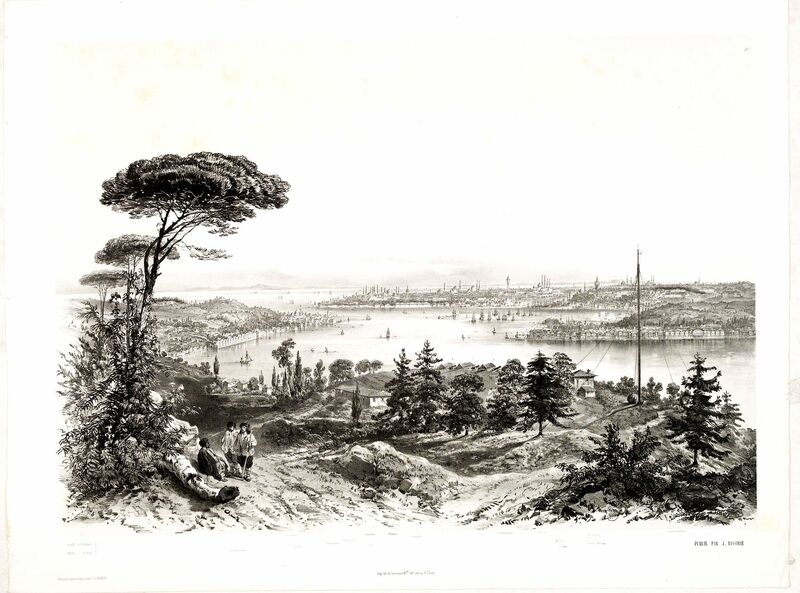 ¤ Fourth sheet from an uncommon panoramic view of Istanbul with extensive shipping. Engraved by C.A.Pfauz and published at the l'Academie Imperiale in Augsburg. 230 ARIAS MONTANUS,B. 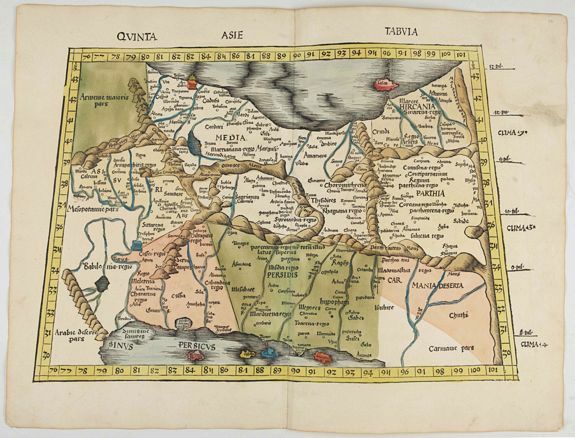 Tabula Terrae Canaan Abrahae tempore et ante adventum… Anvers, 1572. Uncoloured Paper slightly age-toned, several small wormholes throughout: a good and dark impression. 330 x 505 mm. Je voudrais de plus amples renseignements sur le Lot N°23681 . ¤ Map of Canaan at the times of Abraham and before the conquest by the Children of Israel, with the neighboring regions. Oriented to the east. The shore line runs from Turkey as far as Egypt, and inland from the Mediterranean as far as Babylonia. The shore line of Palestine is most distorted. Shows a big Haifa bay, does not mention either Haifa or Acco, but does mention Mount Carmel. The Mediterranean is connected by a river with the Lake of Tiberias. Many names are in Hebrew lettering also. From Benedictus Arias Montanus' Liber Chanaan… Also in his rare Biblia Polyglotte and based on Marinus Sanudo's map of the Holy Land, of c. 1320. Laor, 45. 231 HONERVOGT,J. Terra Promissions. Cologne 1582. In original o/l colours. Paper slightly age toned. Good condition. 367 x 418 mm. Je voudrais de plus amples renseignements sur le Lot N°26620 . 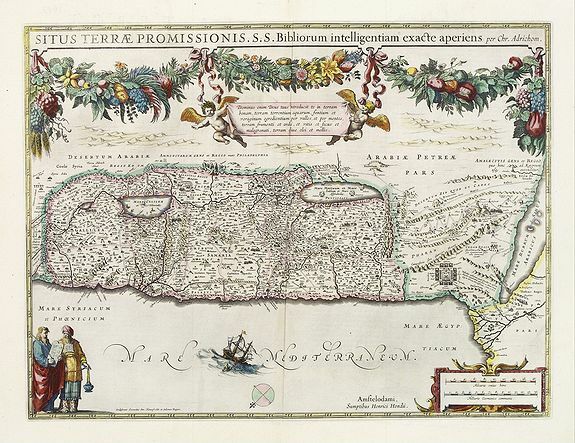 ¤ A beautifully executed and very rare map of the Promised Land, divided into the 12 Tribes. The shore line runs in north-southwesterly direction from Sidon as far as Pelusium. The Haifa Bay does not appear at all and Haifa, not mentioned by name, just out into the sea. The Carmel Mountain reaches as far as the Lake of Tiberias. In the south, the Sinai, shown as a mountainous region, is crossed by the way of the Wandering of the Jews from Ramesses in Egypt through the Red Sea until they reach the Promised Land. In the Mediterranean Sea there are three vessels with full-blow sails, on one of them appears the escutcheon of Michael Aitsingers and his name. 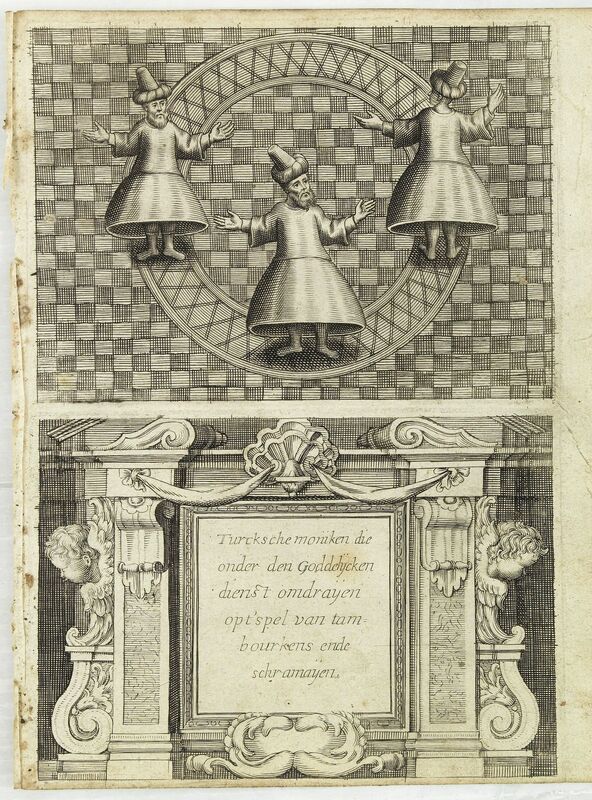 Published by Jacob Honervogt (c.1590-c.1663) who was a native of Cologne and worked from 1608 as an engraver in Paris. After 1654 he worked with Gérard Jollain. ¤ Laor, 28. 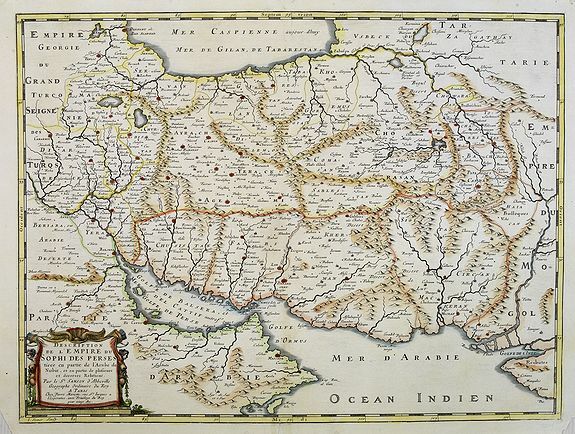 232 MÜNSTER, S. Syria, Cypern, Palestina, Mesopotamia.. Bâle, c.1588. Coloured. Wood cut map. Paper slightly age toned, as usual. Alltogether a fine impression. 305 x 358 mm. Je voudrais de plus amples renseignements sur le Lot N°8410 . 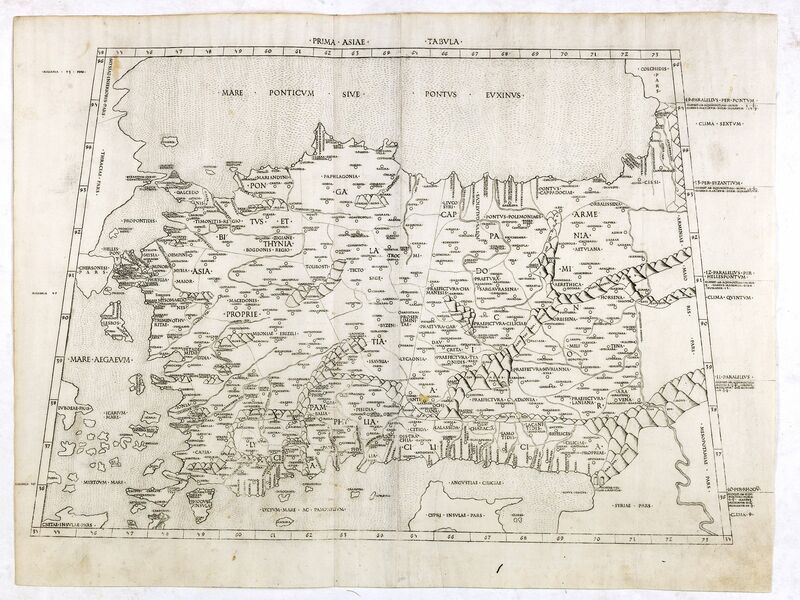 ¤ A famous wood block map of the Near East, including Cyprus, Palestine, Iran and Irak, etc. From his "Cosmographia", that great compendium of Renaissance knowledge. 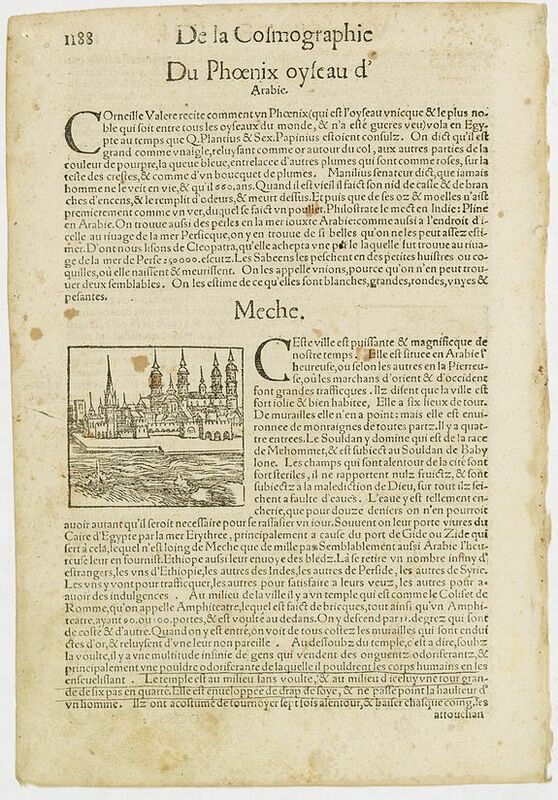 In 1588 new woodcuts were prepared for the Cosmographia. These had finer lines than the former ones. An exciting map. With letterpress title in German in top and text on verso of map. - Laor, 531. 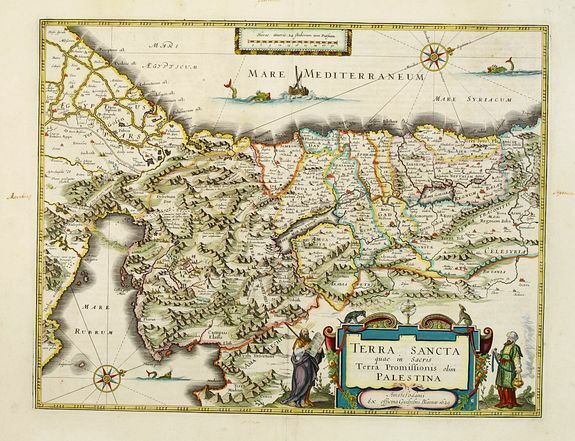 233 ORTELIUS, A. Terra Sancta. Anvers, 1590. Coloured. A good and dark impression. 367 x 505 mm. Je voudrais de plus amples renseignements sur le Lot N°554 . 234 ARIAS MONTANUS, B. Tabula Terrae Canaan Abrahae tempore et ante adventum. . . Antwerp, 1572 / Leiden, 1593. Uncoloured A good and dark impression. Short margins, as issued. Remains of an old horizontal fold, hardly visible. 330 x 505 mm. Je voudrais de plus amples renseignements sur le Lot N°33262 . From Benedictus Arias Montanus' Antiquitatum Iudicarum Libri IX. In quis, praeter Iudaeae, also in Liber Chanaan, and his rare Biblia Polyglotte. Laor, 45. 235 TORNIELLO, A Interior Tabulati Septentrionalis pars. Holland, ca. 1625. Uncoloured. Paper slightly browned. Marginal worm holes in upper centerfold. Else good condition. 280 x 380 mm. Je voudrais de plus amples renseignements sur le Lot N°26467 . ¤ Two engravings on one sheet. In top the walls and in bottom the structure of the tabernacle itself. The gate (on the right) leads you in the outer court to the Brazen Altar behind which we find the Laver before entering the Holy place comprised of : the Table of Shrewbread, the Candlestick, leading to the Holy of Hollies : the Golden Altar and the Ark of the Covenant. The Tabernacle is known in Hebrew as the "Dwelling Place". It was a portable dwelling place for the divine presence from the time of the Hebrew Exodus from Egypt through the conquering of the land of Canaan. Its elements were made part of the final Temple in Jerusalem about the 10th century BC.The Tabernacle was a small tent which contained the most holy writings of the ancient Jews and which they took with them when they were travelling. From an uncommon edition of Kerckelycke Historie van Neder-Landt which was a Dutch text edition of Agostino Torniello's Annales Sacri et Profani by Heribertus Rosweydus (1569, Utrecht - † 1629, Antwerp). 236 BLAEU, G. Terra Sancta quae in Sacris Terra Promissionis.. Amsterdam, 1640. Coloured. Repair of split lower part centerfold. Paper washed, some minor age-toning. 380 x 520 mm. Je voudrais de plus amples renseignements sur le Lot N°5927 . ¤ Orientated west to the top. The decoration is inspired by the Old Testament. Moses stands to the left of the cartouche, Aaron to the right; in the Mediterranean a giant sea monster waits to swallow Jonah; and the course of the Exodus twists through the Sinai. 237 HONDIUS, H. Situs Terrae Promissionis.S.S.Bibliorum intelligentiam.. Amsterdam, 1645. In attractive original colours. In mint condition. 370 x 492 mm. Je voudrais de plus amples renseignements sur le Lot N°2112 . 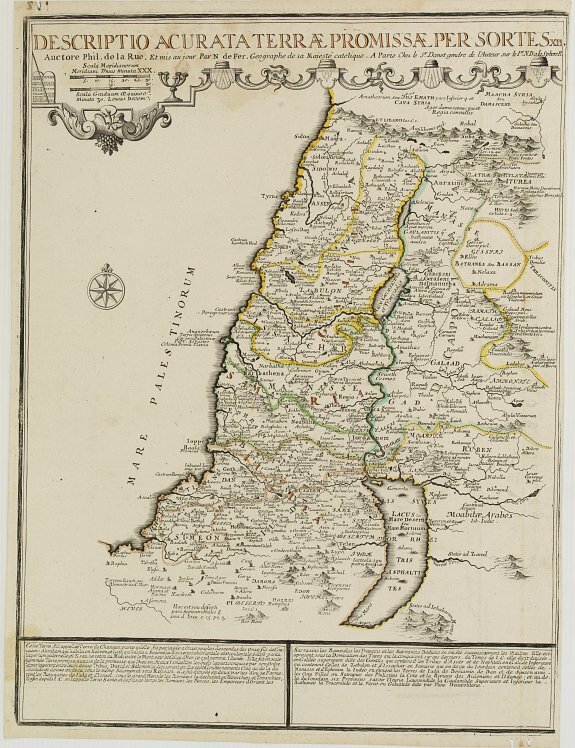 ¤ Superb map of the Holy Land, after Adrichom, with north oriented to the left. It is finely engraved with numerous biblical scenes including the Exodus, the wandering of the Children of Israel, and several battle scenes. A floral and fruit garland is draped across the top, symbolising the land of plenty. It is further decorated with two putti holding up a banner containing a Latin verse, figures of Moses with the Ten Commandments and Aaron dressed in the priestly vestments, Jonah and the whale, and a strapwork distance scale. Latin text on verso. - Loar, 23. 238 VISSCHER, N. De gelegenheyt van t'paradys ende t'landt van Canaan.. Amsterdam 1664. Coloured. Wide margins, in very good condition. 320 x 480 mm. Je voudrais de plus amples renseignements sur le Lot N°11235 . ¤ Very attractive map, showing the location of Paradise. Two vignettes depict the Temptation of Adam and Eve, and their Expulsion from the Garden of Eden. 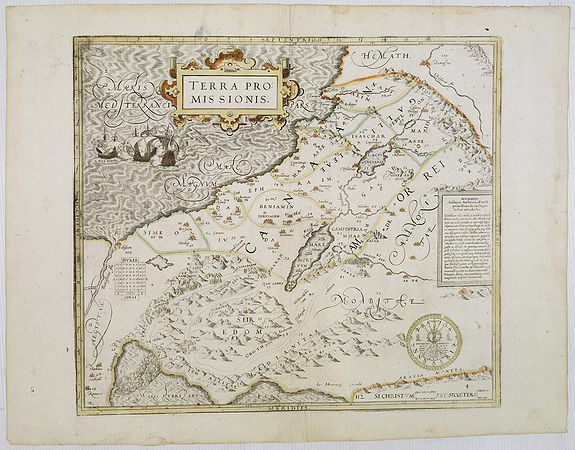 Nicolaes Visscher was one of the sons of Claes Jansz Visscher who also made maps for the Bibles printed in Holland. 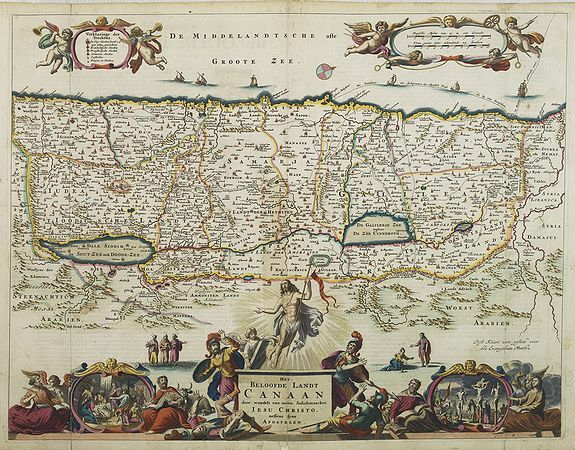 Around 1650 the plates were worn down, so Nicolaes made new ones and there is a distinct difference between father and son: Nicolaes' maps are more refined and for the first time putti are appearing on biblical maps! 239 GONSALES, A [Illustration from Hierusalemsche Reyse.] Turckschemoniken die onder den goddelycken. . . Antwerpen, Michiel Cnobbaert, 1673. Uncoloured. Good and dark impression. Letter press with copper engraving. 185 x 125 mm. Je voudrais de plus amples renseignements sur le Lot N°30799 . ¤ Taken from a very rare travel book by Anthonius Gonsales, "Hierusalemsche Reyse". The book describes his pilgrimage from Antwerp to Jerusalem and back. Giving a detailed illustrated account of the holy places, Egypt, Syria and indigenous flora and fauna. 240 STOOPENDAAL, D. Het Beloofde Landt Canaan door wandelt .. Amsterdam, 1682. In original colours. In stunning original colours. Cartouches hightened with gold. Repair of split lower part centerfold, expertly done. 355 x 462 mm. Je voudrais de plus amples renseignements sur le Lot N°625 . 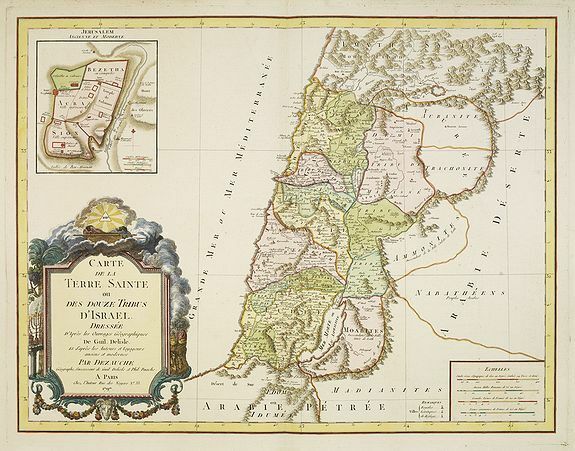 ¤ A beautifully engraved map of the ancient land of Canaan which roughly corresponds to present-day Israel. Cherubs hold up a draped cloth of key symbols, also a scale panel in the sea area and below are panels showing scenes from the life of Christ either side of an ornate title cartouche. The figures and decorations are painted in a somewhat impressionistic way. Varnish is used for the dark shadow areas to highlight the colours. Clearly from an show-piece bible produced for a wealthy merchant or nobleman. - Poortman, Kaarten in Bijbels, G1.5. 241 LA RUE, Philippe de / FER, N. de. / DANET. Descriptio acurata Terrae Promissae per sortes XII.. Paris 1720. In original o/l colours. Traces of humidity on top, along the title. 2 faint brown spots in the lower left corner, affecting the text. Worm holes in the lower right corner, affecting the border frame. Short margins. 475 x 362 mm. Je voudrais de plus amples renseignements sur le Lot N°22870 . ¤ Rare map of the Promised Land by Phil de la Rue and updated by De Fer. Presents a decorative compass rose and some explicatory text at the bottom. 242 ROBERT DE VAUGONDY, G. La Judée ou Terre Sainte, . . . Paris, 1750. Limites en col. d'époque. Water stains in in the upper margin. 480 x 585 mm. Je voudrais de plus amples renseignements sur le Lot N°64069 . ¤ Map of Judee including a map of "terre de Canaan". 243 LATTRÉ/ DE L'ISLE,G. Terrae Sanctae Tabula è Scripturae Sacrae.. Paris ca 1783. In attractive original body colours. Printed on heavy paper. Good impression. 1st map: symmetrical brown spots in the lower corners. 2nd map: some discolouration along centerfold. Minor marginal spots. 685 x 492 mm. Je voudrais de plus amples renseignements sur le Lot N°24283 . ¤ Map of the Holy Land on both sides of the Jordan, divided among the Tribes and according to the division into provinces at the Roman time. The shore line runs from Sidon as far as Gaza. Ornated with a decorative title cartouche. Boundaries outlined in hand colour. A posthumous work of Guillaume de L'Isle, edited by the author's brother. 244 SCHRAEMBL, F.A. 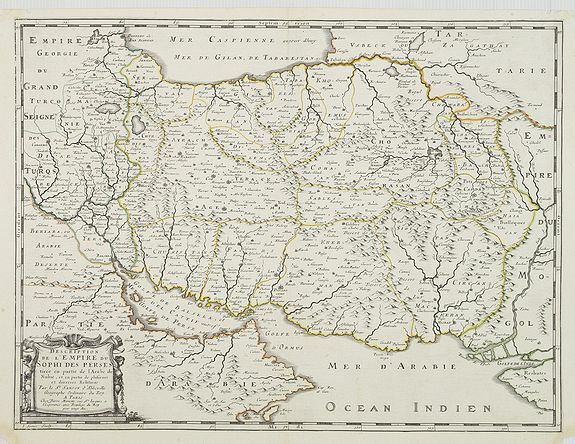 Karte von dem groessten Theil des Landes Jemen Imame, Kaukeban &c. Vienna, 1789. In original o/l colours. Good and dark impression. Wide margins. Very good condition. 570 x 370 mm. Je voudrais de plus amples renseignements sur le Lot N°33824 . 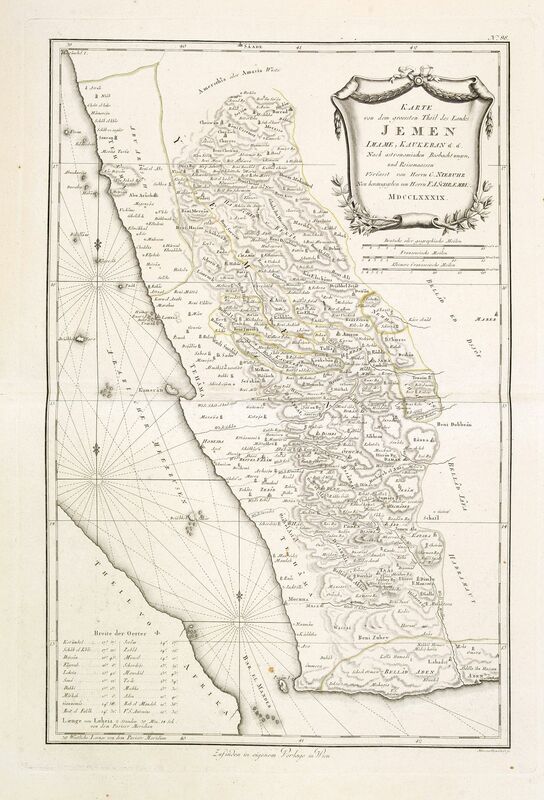 ¤ Large map of Yemen from "Allgemeiner grosser Atlas" published by P. J. Schalbacher - 1786-1800. 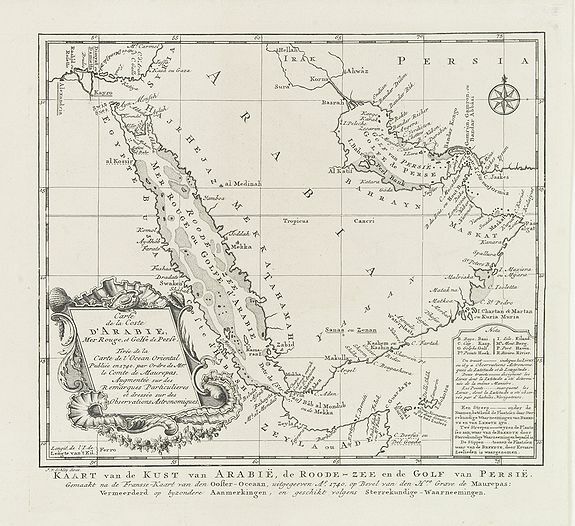 Based on the observations of the Danish explorer Carsten Niebuhr and shows the eastern shore of the Red Sea just to the north of Jizan. Numerous towns, cities, and Wadis are shown interlaced in the dense hachuring to suggest topography. The Red Sea is filled with three compass roses, fleur-de-lis and rhumb lines. In the lower left an index gives latitude and longitude for the major cities. At upper right is an elaborate title cartouche with three distance scales below. 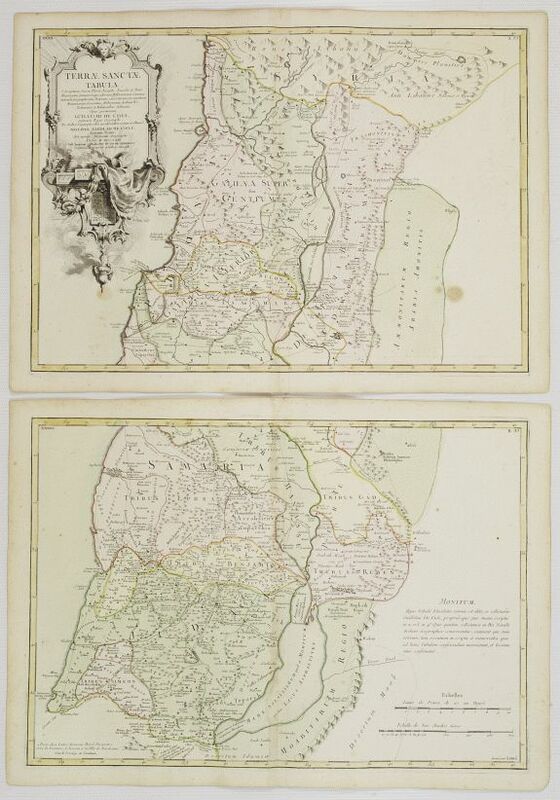 245 DE L'ISLE/ DEZAUCHE Carte de La Terre Sainte ou des douze tribus d'Israel.. Paris, 1797. Coloured. In very good condition. 491 x 650 mm. Je voudrais de plus amples renseignements sur le Lot N°7722 . 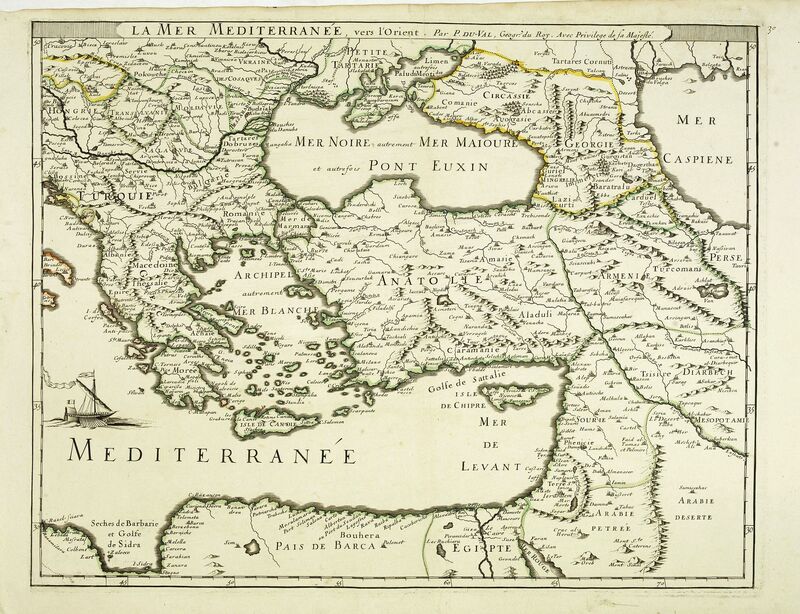 ¤ Fine map of Palestine devided amoung the tribes onboth sides of the Jordan and according to the Roman provinces. The shore line runs from Beirut to the rivers of Egypt. Prepared by G.de l'Isle and published by Phil. Dezauche. 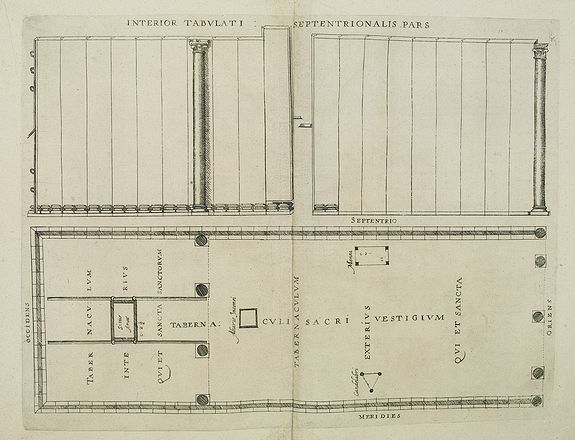 In upper left corner inset plan of "Jerusalem Ancienne et Moderne". A first state of 2, second state with date 1831. - Laor, 250 (First state. 246 DE LAPORTE, L'Abbé. Carte des Régions et Lieux dont il est parlé dans le Nouveau Testament . . . Paris, Prudhomme, Levrault, Debray, 1806. In original o/l colours. Some very light foxing upper margin. Left margin cut short. Else in very good condition. 175 x 222 mm. Je voudrais de plus amples renseignements sur le Lot N°26953 . 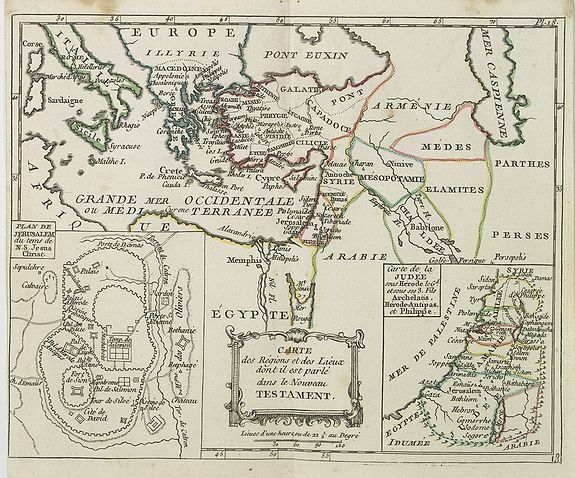 ¤ Map of the regions and sites mentioned in the New Testament with inset maps of the Holy Land and a plan of Jerusalem, from Atlas moderne portatif composé de vingt-huit cartes sur toutes les parties du globe terrestre .. A l'usage des Colléges, des Pensions & des Maisons Religieuses, etc..
247 SCHEDEL, H. Destruccio Iherosolime. Nuremberg, 12 July 1493. Coloured. 2 Wood cuts. Some usual minor age-toning along the centerfold. A few stitch holes filled in. Very good. 460 x 325 mm. Je voudrais de plus amples renseignements sur le Lot N°11248 . One of the earliest obtainable view of this period. 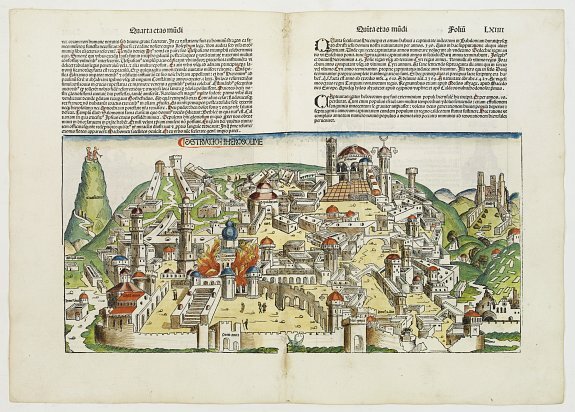 Two pages from the richest illustrated Incunable, the famous: Nuremberg Chronicle , published the year that Columbus returned to Europe after discovering America. The view shows the destruction of Jerusalem. Major points in the city are identified with Latin notations. Of interest, in the upper left of the image are two figures on a mountain top. One figure appears to be Christ: the other figure appears to be the Devil with horns drawn by a contemporary hand and also with a Latin inscription. Above the view are some twenty lines of Latin text. The verso shows various kings and prophets with descriptive text. Click to zoom this side of leaf. 248 RUSCELLI, G. Arabia Felice Nuova Tavola. Venice, 1598. Uncoloured. Mint condition. Italian text on verso. 185 x 245 mm. Je voudrais de plus amples renseignements sur le Lot N°35650 . 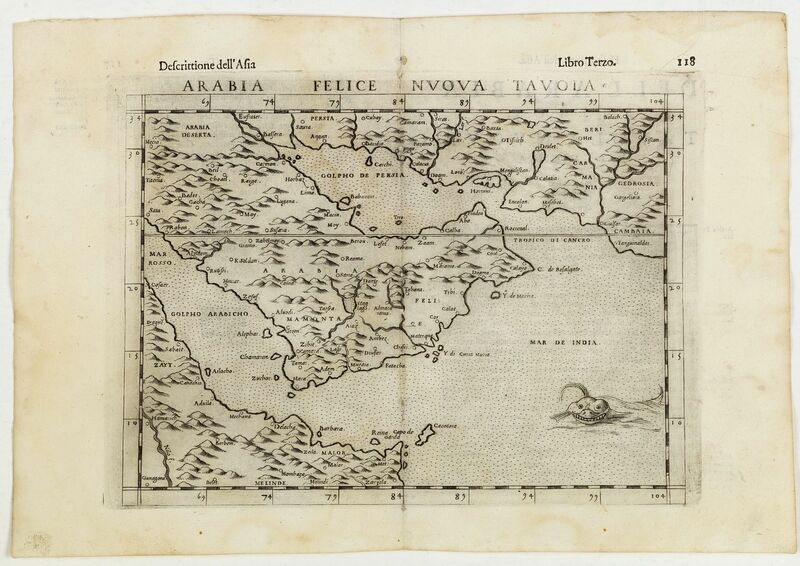 ¤ Fine early map of Arabian peninsula, being one of the earliest modern maps of the region. 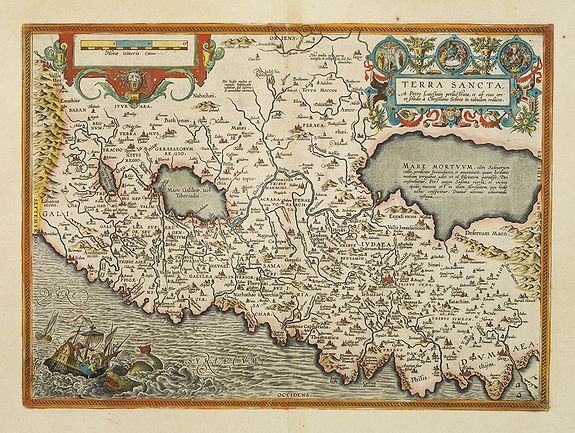 Girolamo Ruscelli first published the map in his "La Geographi di Claudio Tolomeo" (Venice, 1561), with the present example being from the 1598 edition of the work. In 1574 a new plate was used which lasted until the final edition of 1599. In this final edition the plate includes a sea monster. While the earlier editions appear on the market with some frequency, this final edition is much scarcer than its predecessors. 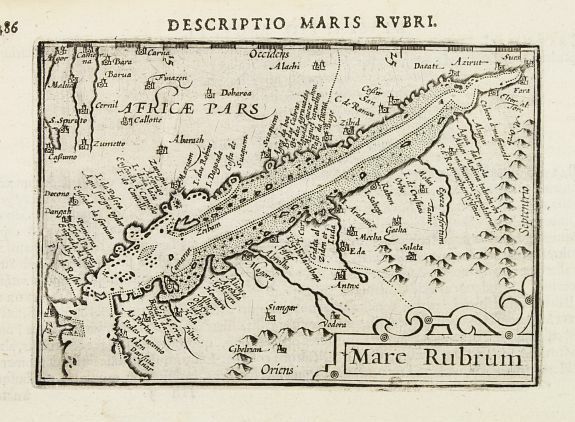 249 BERTIUS, P. Mare Rubrum. Amsterdam, 1602. Uncoloured. A verry good and dark impression. 85 x 123 mm. Je voudrais de plus amples renseignements sur le Lot N°4989 . ¤ Very fine miniature map including the Red Sea, Yemen, east coast of the Arabian peninsula. One of the early maps to focus on this area. Engraved by Petrus Kaerius. - Miniature Antique Maps' by Geoffrey King. 250 HARREVELT,E.van / CHANGUION, D.J. 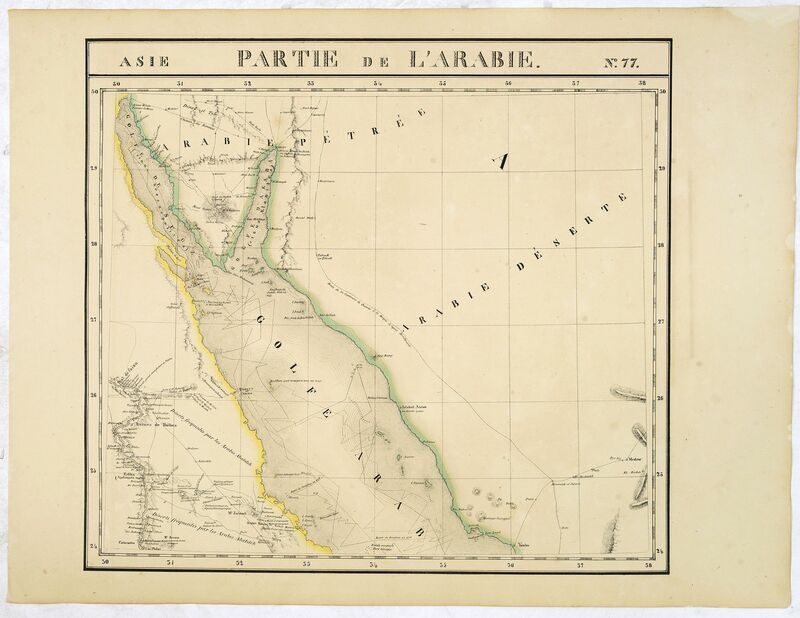 Carte de la Coste d'Arabie. Amsterdam, 1773. Uncoloured. Good and dark impression. 215 x 248 mm. Je voudrais de plus amples renseignements sur le Lot N°27666 . ¤ Uncommon issue of this very nice map of the Arabian peninsula. Depicted is Saudi Arabia, Red Sea and the Persian Gulf. 251 VANDERMAELEN, Ph. Partie de L'Arabie N° 77 [together with] Arabie Heureuse N°. 91. Brussels, 1825-1827. Original colours. Lithography, in original colours. Paper age toned. Plano sheet. 472 x 516 mm. Je voudrais de plus amples renseignements sur le Lot N°33744 . ¤ Two map sheets of Arabia. N° 77 Covers part of Egypt, Saudi Arabia, Jordan and Israel. Shows explorer's sea routes. N°. 91 Arabie Heureuse, covers part of southern Saudi Arabia. Includes lengthy text panel "Note sur l'Arabie. Pour la suite voyez la carte no. 101. (Redigee par A. Delavault)." This atlas was also the first to be made totally with lithography, carried out by Henri Ode, who applied a new technique, especially designed for the Atlas Universel. Koeman: Vdm 1. Phillips 749, Sabin 43762. 252 MÜNSTER,S Meche [Mekka] Bâle, 1575 or later. Uncoloured. Woodblock print with letter press. Paper browned and age-toned. Good impression. 280 x 190 mm. Je voudrais de plus amples renseignements sur le Lot N°14177 . ¤ On recto an early representation of a palm tree (73x47 mm). On verso a representation of the city of Mecca (59x63 mm). From a French text edition of his "Cosmographia", that great compendium of Renaissance knowledge. With contemp. Annotation in brown ink. In 1575 Sebastian Münster's "Cosmographia" was translated into French and published in Paris by François de Belle-Forest. 253 WALDSEEMULLER. Quinta Asie Tabvla. Strasbourg, J. Schott, 1513. Beau col. d'époque. Carte gravée sur bois. Magnifique exemplaire en coloris d'époque. - Repair of a small tear in upper tight hand margin, for the rest in mint condition. 365 x 535 mm. Je voudrais de plus amples renseignements sur le Lot N°62136 . 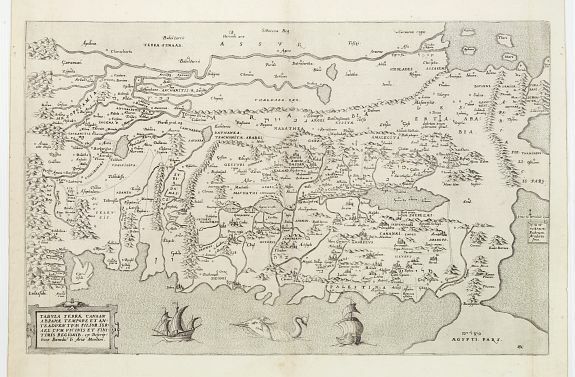 ¤ De 1507 à 1513, Waldseemuller travaille avec son ami Mathias Ringman (1482-1522) à la nouvelle édition latine de la Geographia de Ptolémée, sous le patronage de René II duc de Lorraine. Tandis que Ringmann corrige les textes de l'édition de Ptolémée, Waldseemüller s'occupe des cartes correspondantes et les complète de 20 cartes modernes. Cet ouvrage peut être considéré comme le premier atlas moderne. 254 SANSON, N. / MARIETTE, Pierre. Description de l'Empire du Sophi des Perses. . . Paris, ca 1650. In original o/l colours. Very good condition. 145 x 165 mm. Je voudrais de plus amples renseignements sur le Lot N°25971 . 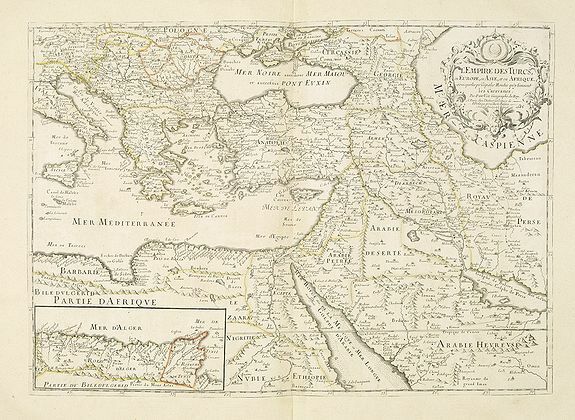 ¤ Map of the empire of Persia is shown to extent from Baghdad, almost to the present-day borders of India. Including part of Saudi Arabia and Oman. Engraved by I.Somer. 255 SANSON, N. / MARIETTE, Pierre. Description de l'Empire du Sophi des Perses. . . Paris, ca 1650. In original o/l colours. Very good. 390 x 520 mm. Je voudrais de plus amples renseignements sur le Lot N°25972 .